Hariwake is a variety of the Japanese carp which you get when you cross between different groups of the Ogon, originally a single-colored metallic koi, then mixed and interbreed to produce the combination of yellow-gold or orange pattern marking seen against platinum base backdrop, a feature that defines the Hariwake. They are much appreciated due to their unique metallic shining appearance that never fails to impress even the die-hard koi collectors who often aims for perfection. There are different types of koi classified under the Hariwake group; most common are the Doitsu, Matsuba and Yamabuki. Just like goldfish varieties, all of them have a special unique attribute that defines each and every one of the fish. You can actually make out the difference by evaluating the special color mix and pattern distribution, scale shading especially with the metallic shining types and also they are judged based on their body shape with features like the fin and caudal peduncle development. 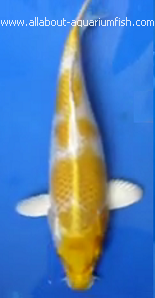 Over the years, there are constantly new breeds and varieties of Hariwake produced, that put on a unique appearance not shared by the other fish and usually a fine, newly developed specimen are sold at higher price. Care requirements for Hariwake is basically the same as with the other Japanese carp as they need high nutritional content in their diet to develop their shining coloration and armor-like scale appearance. The fish when they are young will often look like a common koi and even the most experienced hobbyist sometimes failed to identify them and instead classify the fish as belonging to different categories. This problem on identification is often made complicated due to the fact that all types of koi including the Hariwake can always change color easily as they grow and transform throughout the years until they mature into adulthood. Some of these fish although will look almost just the same but upon close observations, you can actually made out those unique features that set them apart. Developing a champion fish often requires a lot commitment and that is especially true if you want your Hariwake to become among the best. Usually in order to make sure that they achieve full size development, one must ensure that the water quality is top notch. Most often you can find some hobbyist leaving the pond water to be slightly greenish (with some algae growth) so that the water will have natural microorganism growing in it that serves as extra supplement for your Koi. Any sign of disease seen on your pet must be treated immediately and usually loss of coloration, reduced activity and unwillingness to accept foods are signs that spread of disease is imminent and has started to take place. If you can afford it, constant addition of vitamin supplement like those naturally found in koi pellets such as dainichi and hikari brands are known to promote excellent growth, color development and overall act as disease prevention.